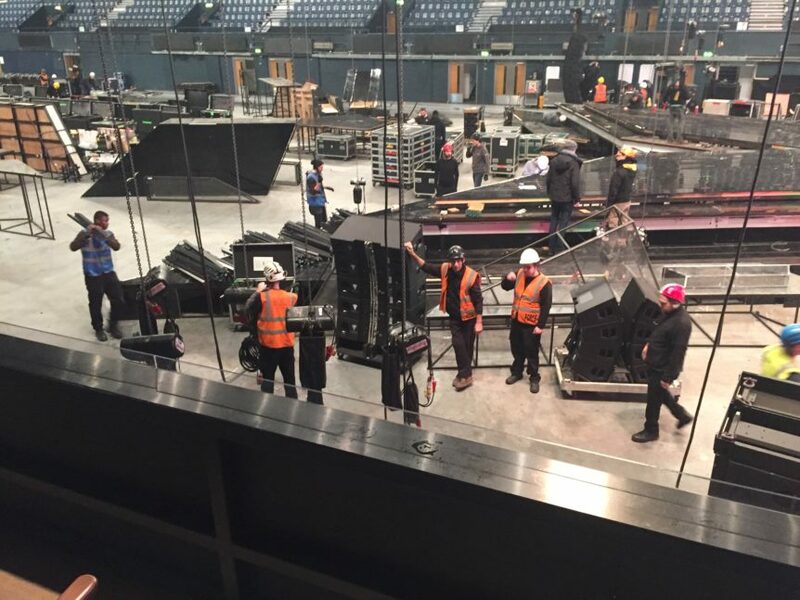 When filming for the Auditions and Six Chair Challenge elements of this year’s series of the X Factor took place at the SSE Wembley Arena, Showforce was on-hand to lend crewing support to PA-Productions during the technical changeover. The team at Showforce were onsite for 19 days working assisting audio visual, sound, set and rigging suppliers. The Auditions set up was slightly less elaborate than that of the Six Chair Challenge so the crew were tasked with removing small sections of Steeldeck and replacing them with the famous X stage. Once the stage had been replaced, the lighting rig was taken down and replaced with a video wall. The crew then assisted with installing lighting around the stage area and the additional speakers required for filming. Showforce also supplied two qualified and highly experienced forklift drivers to help with loading and unloading equipment. The crew made light work of the changeover and amassed an impressive 873 hours over the course of the 19 days on set.